Line a 7" cake tin with baking paper and grease the sides, preheat the oven to 180C. 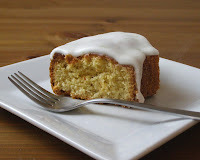 In a large bowl beat the margarine with the sugar until light and fluffy, I just use a whisk. In a separate bowl mix together the flour, polenta, baking powder and salt. Add the zest and orange extract to the margarine mixture and whisk well. Now add some of the flour mixture and beat with a wooden spoon, then add some of the soya custard and beat well. Alternate until all the flour and custard is added. Scrape into the prepared tin and level the surface. The batter will be very thick, you'll need to spoon it in, it's not a pouring batter :-) Bake for 30 minutes or until firm and golden on top. Let cool 5 minutes in the tin then turn out upside down onto a wire rack and remove the baking paper. For the syrup add the orange juice and sugar to a small saucepan and bring to a boil, stirring all the while. Reduce to a simmer for 5 minutes, stirring often until it thickens up and the sugar is dissolved. Set aside. 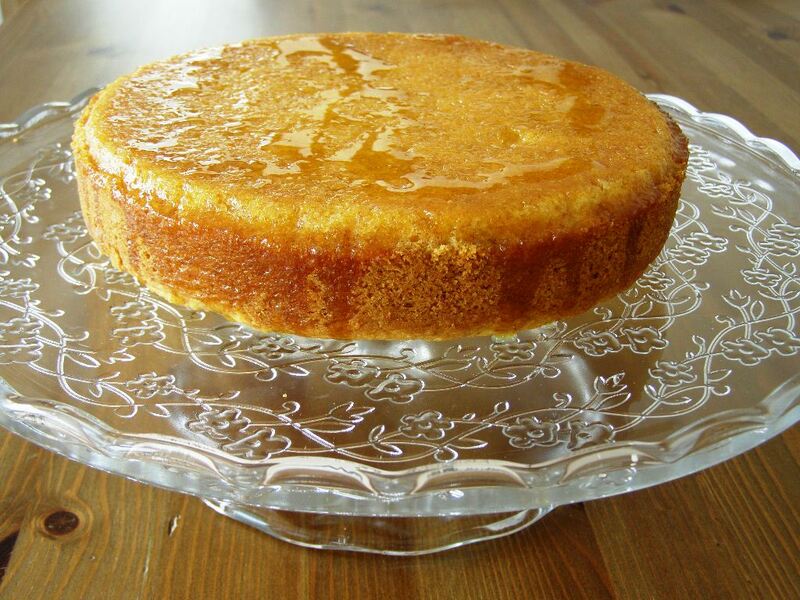 Now you can either pour the warm syrup over the warm cake or wait until it all cools. Either is fine. 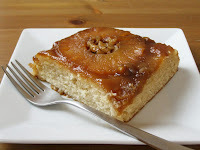 I poked a few holes around the cake and poured the warm syrup over the warm cake until it couldn't take anymore, then poured the rest over when it was cooled to finish off the syrup. Serve once cool, great with tea or coffee. The ingredients sound really interesting! And it looks fantastic. I love cakes with syrup. Thanks for this. 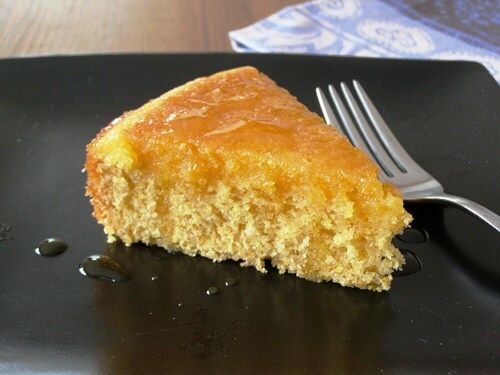 I was just thinking about polenta cake the other day and wishing I had a good vegan recipe! I'll post a link to this from Cake Liberation Front Facebook page too. Many thanks to you both :-) Cheers for posting this too, I've not heard of the Cake Liberation Front, will definitely check it out! Looks delicious and like it has a nice crumb. I may have to try this cake for an upcoming potluck! I made this cake, it's excellent and different!Regards form Slovenia. Nice. I love an everyday cake. I adapted your recipe (adding 2T. fresh orange juice to the batter and Cointreau to the syrup) for afternoon tea on 3 June for the Diamond Jubilee. It was a great hit with everyone, vegan and otherwise! It is one that I will make again. My husband baked this for me on the weekend. It's gorgeous. I haven't tried cakes with polenta before. Is the polenta what makes it bit crumbly?